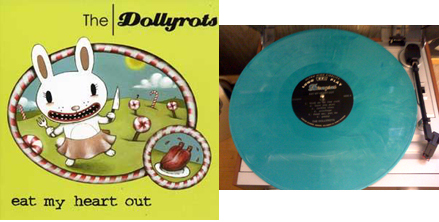 In 2004, The Dollyrots first album “Eat My Heart Out” was released as a vinyl LP on Dionysus Records and CD on Lookout / Panic Button Records. 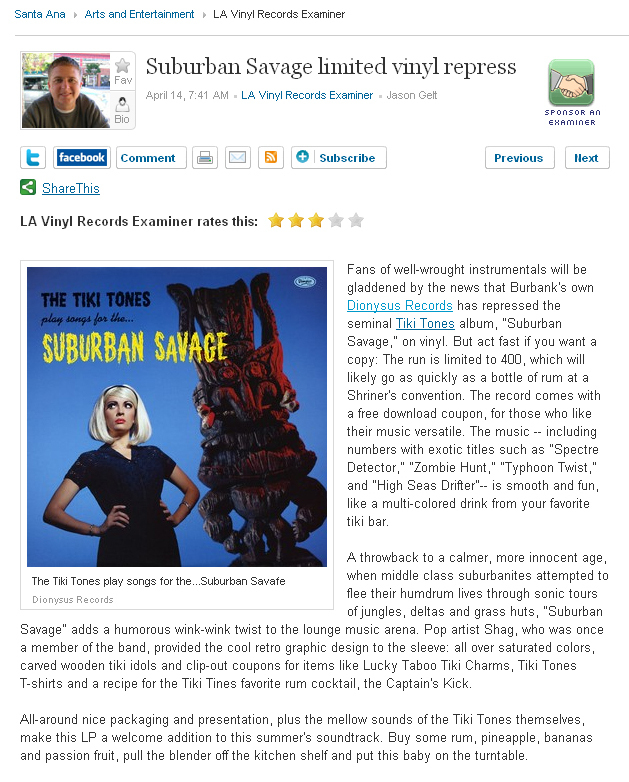 Shortly after the album’s release, both versions sold out. This week, Dionysus Records in conjunction with The Dollyrots have pressed up 500 copies of “Eat My Heart Out” on blue and white opaque vinyl with a download coupon which includes the entire album plus three bonus B sides, just in time for their tour supporting The Buzzcocks. Some of the pressing will be sold on tour, some will go into distribution and a few will be sold via Dionysus Mail-Order. The Dollyrots are inspired by the early ’60s Brill Building song-writers and the related girl-group sound of the same era, with the attitude and attack of The Ramones. Their current albums are on Joan Jett’s Blackheart Records. Here are their upcoming tour dates! Go see ’em and pick up the new reissue or click here to buy the album directly from Dionysus Records. Opening at La Luz de Jesus Gallery on April 2nd (alongside fellow pop-surrealist Max Grundy), Read Between the Lines: The Art of Dennis Larkins, is a three-week show – his first L.A. showing in three years – featuring a new body of painted three-dimensional-relief extravaganzas on display for the first time. Pioneering and refining a bold new approach to artistic expression, Dennis works in a style forged from both traditional and space age ingredients, creating layered works of arresting depth and intense optical punch. Growing up bathed in the glow of the Atomic Age is bound to scramble any thinking person’s circuits. Dennis has been turning to art to heal his radiation burns from the time America started planting its own mushroom forest out in the Nevada desert a few decades ago. Come out to La Luz de Jesus Gallery on Friday, April 2nd, to meet the artist at the opening reception of his new show, “Read Between the Lines”, then come back on Saturday, April 3rd, for the launch of his new book, where Dennis will be available to sign copies. For more of Dennis’ art and history, visit www.startlingart.com. All American Softy and treats by The Nickel pastry chef Sharlena Fong will be avalible during Scott Hove’s “Iced Out” exhibition at the newly expanded La Luz de Jesus Gallery! “Iced Out” is a celebration of the artificial, acknowledging our tendency to embrace illusion in order to feel safe and receive emotional gratification. The fake cake sculptures, with their display of beauty and potential for satisfaction, lure the viewer into a sense of anticipation. They also contain elements, not immediately seen, that create a sense of anxiety and fear. This in turn creates a visual and emotional resonance that is intended to represent what we all have to deal with in our lives every day…the hunt for satisfaction and the anxiety that we won’t get it. Scott Hove‘s works encompasses a broad variety of media, from sculptural installations to painting. The cakes are formed using carvable polyurethane foam and plywood. They are frosted with a variety of acrylic media and accessorized with fake fruit and other objects found in stores or on the street. The materials and techniques borrow from traditional and decorative arts and craft to render the oftentimes jarring objects and fantasy installations. Fong’s pastries and All American Softy will sweeten up this fabulous opening AND celebrate of the expansion of La Luz de Jesus Gallery! Many years ago, when dinosaurs roamed the Earth and played loud rock music, multi-media dimensional assemblage and fine artist Dennis Larkins was busy bringing set design out of the Paleolithic with revolutionary arena rock stage concepts. Under the aegis of legendary promoter Bill Graham, Larkins brought a vision of monolithic drops to life in the form of towering painted backdrops and scrims. Taking what he’d learned as a painter of stage backdrops for the San Francisco Opera, Larkins almost single-handedly designed and painted the set decorations for the annual “Day on the Green” music festivals, such as the original legendary “Monsters of Rock” festival (featuring Aerosmith and Ted Nugent), concerts for Led Zeppelin (in what would prove to be their last American concert), the Eagles, Journey, and many more legends of Seventies rock. Bill Graham Productions’ development of the stadium/arena as a venue for concerts, demanded performances that delivered a memorable show not only in terms of the music, but in the visual aspect as well. Larkins was one of the earliest developers of these revolutionary new staging concepts. Working from a design, often conceptualized in conjunction with BGP producer Peter Barsotti and executed in a matter of days, Larkins would literally hand paint and hang extremely large, full sized backropdrops from the stage superstructure. . In addition, Larkins also performed yeoman’s work as a graphic artist for BGP producing t-shirt designs and posters. Larkins career as a set designer reached its zenith when he designed and implemented the Rolling Stones 1981 American tour set package in conjunction with Japanese graphic artist Kazú. In the next two decades, Larkins saw an evolution into a respected career in themed exhibit and attraction design, taking a job in the Disneyland Parade Float Shop, where all those nifty floats you see making their way down Main St. three to five times a day are constructed. Soon after, Larkins moved up to a desk job as a Walt Disney Imagineer. He later went on to work for a diverse spectrum of theming outfits, both on a freelance basis and as full-time employee, from the Korean company SuperTech to local contractor SpectraF/X, from MCA/Universal to Warner Bros. Studio Stores to Sega GameWorks. Larkins filled what free time he had with his own work in fine art. It was during the ‘70s and ‘80s that Larkins developed and refined his dimensional technique, at first with great gobs of paint, later in mixed media using various plastics and flexible materials. “Read Between The Lines…” accompanies the release of Larkins’ book, “Startling Art: Revealing the Art of Dennis Larkins” (published by La Luz De Jesus / Last Gasp) which takes an often-irreverent look at one man’s personal creative journey, both personal and professional. From his legendary posters for the Grateful Dead and monumental set designs including many never before published photos of his days with Bill Graham Productions, to the meat of the book, a riotous extravaganza of pop-surrealist fine art, page after picture-packed page reveals the startling contents of one of the great unrecognized creative minds of the past half century. Larkins earned his BFA degree from the Kansas City Art Institute with post graduate studies at Yale University and at Colorado U. in Boulder. Larkins’ art is in the collections of the Bill Grahm estate, Morgan Spurlock, John Malkovitch, Carl Gottlieb, Don Henley, “Cheech” Marin, Taran Smith, Jay Nailor and Billy Shire.